In the wake of an arson (was it a hate crime?) that leaves her family homeless many people step up to help out, including Saba’s classmates who decide to hold a fundraising auction. But things get REALLY complicated when artworks found in a dumpster turn out to be more valuable than anyone expected… and they they are stolen. The answers to arson and art theft can be found by reading police reports, text messages and the alternating stories of the suspects. 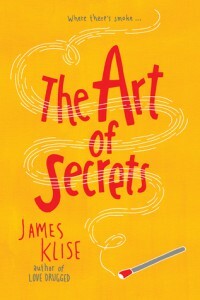 Can you learn The Art of Secrets?